UPDATE: We reached Amazon bestseller rank - and became #1 New Release in categories Motherhood and Pregnancy & Birth - TWO months before the book even hit bookstores! Did you ever Google “pregnancy over 35” or "pregnancy over 40" for helpful advice and inspiration? Did your hope and excitement quickly turn to disbelief and shock when you saw countless negative stories on the increased risks of later pregnancies and the staggering rise of infertility? Just skimming the headlines made your heart sink, right? The Joy of Later Motherhood is the much-needed antidote to all the negative hype surrounding mature motherhood. 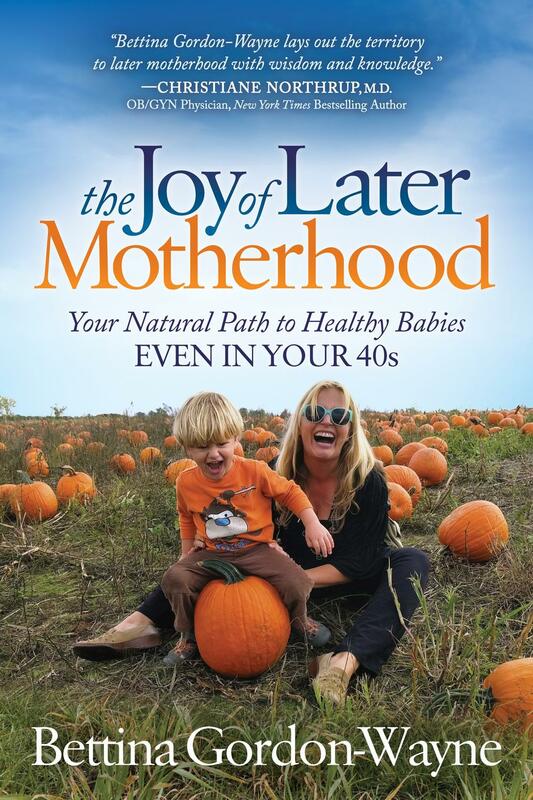 It is a positive, truthful, and inspiring guide full of real-life stories and helpful insights from more than 40 women (and top natural fertility experts) who all had natural pregnancies and healthy babies in their 40s. With candor and love these women tell of heartbreak—like infertility diagnosis and miscarriage—and triumph—from healing disease to finding their faith. They share their stories to empower other women to approach this topic from a position of strength and courage and to show what’s possible and, in fact, natural. For The Joy of Later Motherhood, I've put my experience as a seasoned journalist to good use and interviewed more than 40 women over 40 who all had natural pregnancies and one, two, even three healthy babies at an age mainstream deems "dangerous". Why don’t we know more encouraging stories like these? Because the empowering stories are usually not told. Until now. I collected stories of joy, love, pain, resilience and the courage to overcome seemingly insurmountable obstacles. I prepared their stories for you, the reader, in hope that they will bring you inspiration, guidance and maybe some solace for the heartaches you may have already faced. Whatever your experience or concern, chances are we, the women I interviewed and myself personally, have been there as well. Each and every mother who said “Yes!” to sharing such a profound sliver of her life so openly in this book did it out of love and compassion for you, the lady and mother-to-be who opens these pages. We believe in helping each other and we believe in the eternal female bond that connects us, particularly around the topic of children, birth and the continuum of the world. This book contains our stories, our honesty, our tears, our triumphs, our collective wisdom, our advice and our compassion and, most importantly, our deep love for all the other women out there who are where we once were: ready to start a family and wondering how it will all pan out. You’d like to approach the topic of mature motherhood from a position of strength and power. You have a hunch that there is more to conceiving a child than just the physical act and you are curious as to the experience of others. You would like to get pregnant in the near future or in the next couple of years and you are already worried because of your age. You’ve tried to conceive naturally but it has not worked out yet. Now you want input from other women on improving your chances physically, mentally and spiritually. You are afraid that your body may fail you. Or that your contradictory thoughts – “I would love to have a baby, but I don’t think I can give up my freedom!” – may influence your fertility. You feel alone and isolated because you’ve already experienced more than your fair share of heartache. You need different perspectives to help you go on. You’re worried you’d be mistaken for “grandma” at the playground, and younger parents and society would judge you for your choice. You wonder if it is fair to a child to have older parent(s) and whether they’ll have to shoulder the burden of an ailing mother or father long before his or her peers. You are worried. You are upset. You doubt that motherhood will ever happen for you. We get it. We’ve been there. At least one of us has your back, maybe more. With our stories, we want to lovingly see you through this journey as much as we can.